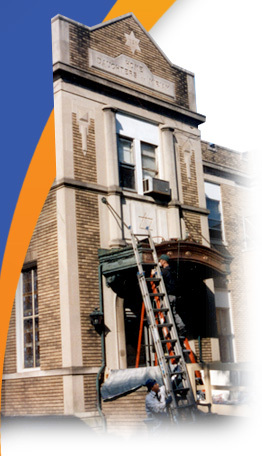 Daughters of Miriam Center has been serving the seniors of northern New Jersey for over 90 years. Yet, the imposing buildings that have stood for decades at 155 Hazel Street in Clifton have their roots in the communities of Paterson and Passaic. Daughters of Miriam’s humble beginnings began in 1913 when the Reverend Buchin dared to dream that a facility was needed in order to meet the needs of the changing community. According to our archives, the author traced the concept to that date when it was discussed by a group of women of the Malbish Arumin Society. These women brought relief to poor families and recognized the need for a shelter for both orphans and the aged. Seeking a home in which to carry on their noble work, these pioneers interested the Honorable Nathan Barnert who purchased the grounds at 469 River Street, known as the Ashley Homestead. On November 1, 1920, Mr. Barnert deeded the property to Daughters of Miriam in memory of his wife, Miriam Barnert. On Tuesday, May 17, 1921 the Barnert Hebrew Free School Band played the Star Spangled Banner and the Hatikvah. Filbert Rosenstein was the chairman of the dedication exercises. Isidore Simon, president of the Home of the Daughters of Miriam for the Aged and Orphans, addressed the crowd while Nathan Barnert, former Mayor of Paterson, viewed the unfolding drama from the dais. Later that same day, the first group of children from the Paterson Orphan Asylum were admitted to the Home along with a group of senior citizens. As time passed, it became evident that it would be necessary to provide larger quarters for the children and aged. Two years, however, were to pass before the Board of Directors went to the public to seek money for a new building. Over $91,000 was raised. On May 17, 1923, the 43-acre Bannigan Estate, located on Hazel Road in Clifton, was purchased. Under the chairmanship of Samuel Neinken, the Building Committee adopted plans and awarded the construction contract on March 18, 1926. The very next day, ground for the structure was broken. Although there was no formal program, a crowd was present to witness the simple but impressive exercises. The Honorable Nathan Barnert, our benefactor, had the distinction of formally breaking ground. Two months later, on May 23, 1926, a capacity crowd of over 2,000 assembled for the cornerstone laying exercises. Moderated by Filbert Rosenstein, the ceremony brought together officials from Clifton, Paterson and Passaic as well as the governor of the State, A. Harry Moore. The venerable philanthropist, Mr. Barnert, placed the cornerstone in position on the northeast corner of the structure. On Sunday, January 30, 1927, thousands wended their way into the building to participate in the dedication of the new facility. “A dream come true," was the way Samuel Neinken described the beautiful new home in presenting the key to Nathan Barnert who in turn passed it to President Simon. While it was a proud day for all who had participated, it was a prouder day still for those leaders who dreamed and strived and toiled for a new and comfortable home. During the years 1944 to 1948, Daughters of Miriam slowly relinquished its program for dependent children to a professional casework agency which placed the children either in foster homes or placed them for adoption. The interior of the original building was then expanded and adapted to provide better care for the aged. A 60-bed nursing unit and staff building with a variety of services was added. From 1952 to 1957, Daughters of Miriam merged with the B'nai Israel Home for the Aged in Passaic, added 85 new beds and reduced the bed capacity of the original building to eliminate dormitory-style accommodations and to make room for additional service facilities. The Home gradually was transformed from a predominantly domiciliary setting to a total nursing system with concomitant increase in staff and expenditures from 1957 to 1963. Beginning in 1963, the Home witnessed a growing partnership of government funding with private philanthropy through the introduction of Medicare and Medicaid and Federal loans and grants for construction. As a result, Daughters of Miriam moved towards a greater dependence upon third party (State and Federal) payment for services. It also increased its campus complex to six buildings with corresponding expansion of Board and staff responsibilities towards many, varied levels of care. The opening of the five-story Rothenberg Building in 1966 raised the bed capacity to 300 and provided modern facilities to house and care for elderly residents. In 1967, the Brawer Building (Miriam Apartments I) opened its doors and began providing apartment tenants with independent living combined with security and ready access to medical and social services. This process would continue in the 70s with the completion of the Esther and Sam Schwartz Building (Miriam Apartments II) which represented an additional 150 units to the existing 130 units in the Brawer Building. The latest two additions—the new nursing care building and the Miriam Apartments—made it mandatory, by comparison, to upgrade the older facilities. This major capital task was accompanied by a determination of future policy and a re-orientation of Daughters of Miriam in relation to funding, intake area and program responsibilities. The aim was to achieve a balance between social and health-related care, between traditional Jewish commitments and governmental demands, and a synthesis of an in-house program for a selected clientele and a community program for the aged in general. The 80s saw more construction as the 36-bed tower opened and was later endowed by Eva & Morris Feld. This brought the Center’s licensed capacity to 340 beds. As healthcare demands increased, Daughters of Miriam Center kept pace with the change. The 90s gave rise to further development as the Center witnessed the opening of the B.I. Cohen Family Building, a 27,888 square foot building which replaced parts of the facility dating back to the 1920s. The B.I. Cohen building houses a state-of-the-art Glatt Kosher kitchen, a staff cafeteria, the admissions office and the social services department. In addition, foresight in planning the building provided the infrastructure to support the construction of two additional floors in the future. Due to declining occupancy rates, the Center needed to create a new revenue stream and, consequently, entered into the subacute market. The two stage subacute care project began with the renovation of 1 West which was completed in 1996. By the time renovations were completed on 1 East in 1999, the Institute had already served 1,800 patients. The modern facility was designed for the patient who requires rehabilitative or medically complex services. Blending the technology of acute care and the therapeutics of a rehabilitation philosophy in a supportive skilled setting, the Institute is a cost-effective alternative to an extended hospital stay. Philanthropists Herbert and Betty Gallen endowed the new wing which was then named in their honor – The Gallen Institute for Subacute Care. A Patersonian by birth, Herbert and Betty have played a major role in the expansion and development of the Center. Their generosity throughout the years has distinguished them as the Center’s largest benefactors. The evolution of Daughters of Miriam from a "Home for the Aged and Orphans" through a "Home and Infirmary for the Aged" to its ultimate expansion and transformation into a "Center for the Aged" is foremost the story of people: People within these walls and outside of them, lay and professional, men and women, young and old, rich and poor, individuals and groups, intensely Jewish and totally assimilated, black and white, Jewish and Christian, recipients and dispensers of care, humble and proud people, a happy fusion of minds and hearts, ideas and actions. All traveled a part of the road - indigenous to their time and place - and are responsible for the achievements of Daughters of Miriam Center. We are by no means at the end of the road. Discoveries, changes and ideas will continue for generations. And, as in the past, the voyage will be punctuated with frustration and hope. This retrospect is intended both as a celebration of our progress and as inspiration to those who will continue to lead.